LTS 1: Strong separation from all except low speed, low volume traffic. Simple crossings. Suitable for children. There are criteria for determining LTS for route segments and crossings. LTS criteria were first published in 2012 in a report by Mekuria, Furth, and Nixon published by the Mineta Transportation Institute. They are summarized in these LTS Criteria Tables, which are repeated with commentary below. Levels of traffic stress for a route combine over segments using weakest link logic. That means that if most of the links on a route have LTS 1 or 2, but one or a few links on a route have LTS 3, the route as a whole has LTS 3. 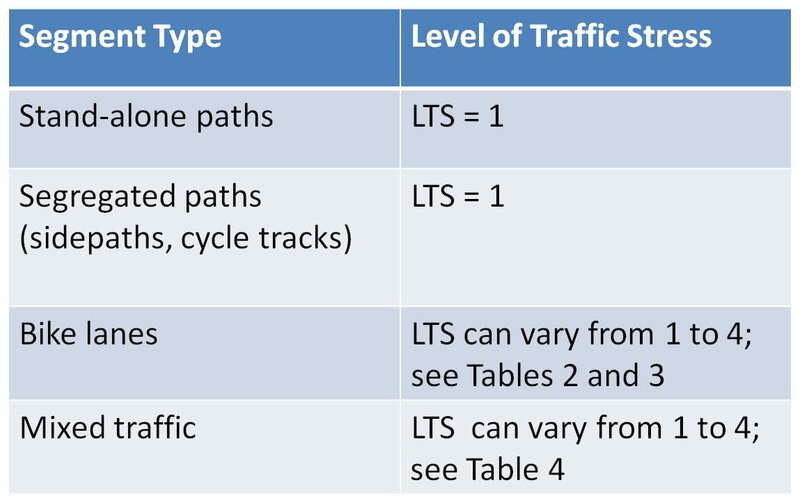 As shown in Table 1, stand-alone paths and cycle tracks have LTS 1 because of the physical separation from traffic they offer. Bike lanes and riding in mixed traffic, on the other hand, can present the full range of traffic stress depending on details of the road configuration. If a cycle track loses its segregation on intersection approaches (e.g., the cycle track converts to a bike lane or a shared “mixing zone”), those segments should be evaluated as bike lanes (see below) or intersection approaches in the presence of a right turn lane (see below). Table 2 has criteria for bike lanes next to a parking lane. 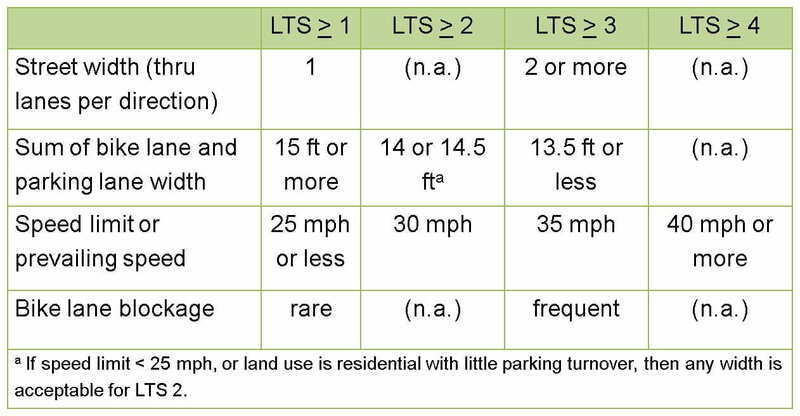 Table 3 has criteria for bike lanes that are not alongside a parking lane. Street width (number of through lanes). For example, if a street has 2 through lanes per direction plus a central two-way left turn lane, it has 4 through lanes. Note that traffic volume is not in input (though, of course, it affects traffic stress indirectly because streets with higher traffic volumes have more lanes). Auxiliary left turn lanes and central, 2-way turn lanes do not affect traffic stress. Right turn lanes affect traffic stress through criteria for intersection approaches (see Table 5). The reach of the bike lane from the curb. That is the combined width of the parking lane, bike lane, and any buffers. Where the reach is great, cyclists can ride without worrying about being doored by cars on their right or hit by cars on their left. Where the reach is limited, cyclists have to balance the hazard of moving cars on the left with the hazard of potential dooring on the right. Prevailing traffic speed. In cities in which speed limits are closely aligned with actual traffic speeds, speed limit can be used. In such a situation, speed limit 25 (for example) typically means traffic typically goes at a speed under 29 mph. If speed limit is not closely aligned with actual traffic speeds (for example, the same speed limit is used on narrow streets where traffic routinely goes 25 mph and on highway-like avenues where traffic goes 40 mph), then it is not appropriate to use speed limit; instead, use a measure that approximates what the speed limit would be if it reflected actual speeds. Bike lane blockage frequency. If a bike lane is so frequently blocked, as is often the case in commercial areas, that cyclists are routinely forced to merge into a through traffic lane, then the bike lane offers little protection from traffic. For bike lanes not alongside a parking lane, the relevant factors are the same, except that bike lane reach is replaced with bike lane width, which should include the width of any marked buffer. 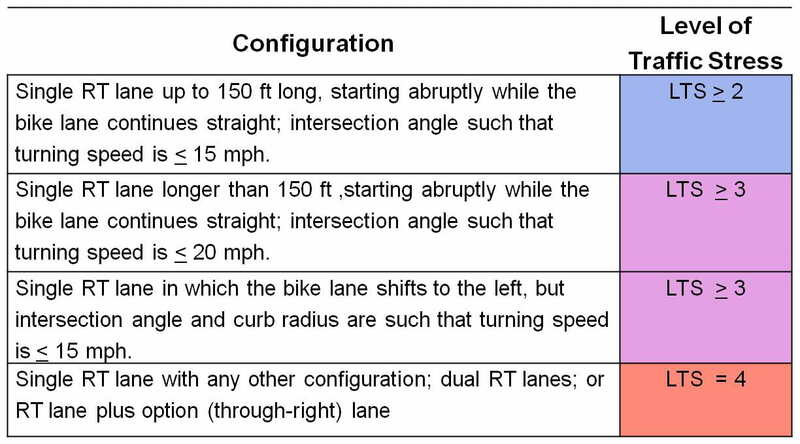 Table 4 has criteria for bike lanes that are pocket lanes — that is, bike lanes that lie between two travel lanes, usually a thru lane on one side and a turn lane on the other. When a right turn lane is added on an approach to an intersection, cyclists lose their partially protected position on the right edge of the roadway and are forced to interact with right-turning traffic in advance of the intersection. 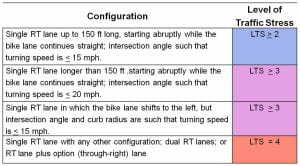 The table below assumes the pocket lane borders a right-turn (RT) lane; for a pocket lane bordering a left-turn lane, simply replace RT with LT.
Pocket bike lanes never have LTS 1. To achieve LTS 1, the bike path should be converted to a cycle track – taken out the street, routed around the right turn lane, and provided with a safe crossing treatment that avoids conflicts with right turning traffic. Sometimes there is insufficient space for a pocket bike lane, and a bike lane is marked within the right turn lane, as illustrated in the NACTO Urban Bikeway Design Guide where it is called a “combined bike lane / turn lane.” Sometimes it is called a “mixing zone.” In applying LTS criteria, these configurations can be treated the same as a pocket bike lane. When a cycle track devolves to a “mixing zone” at intersections, with thru bikes sharing space in a turn lane with cars, this is another example of a “combined bike lane / turn lane” and should be evaluated using Table 4. For bikes in mixed traffic, level of traffic stress increases with traffic speed and number of lanes. On multilane roads, traffic volume is not a factor. Two additional factors become important on so-called 2-lane roads: stress is lower if average daily traffic (ADT) is 3000 or less and no centerline is marked. (Most quiet, local streets have both of these characteristics.) On such streets, cars tend to drive in the middle of the street, moving to the side when meeting an oncoming vehicle. It’s far less stressful sharing a road with cars where the cars are actively sharing the road with each other in the same way. Sharrows and similar shared lane treatments are not assumed to have any effect on traffic stress. Level of traffic stress for unsignalized crossings increases with the number of lanes being crossed and the speed limit or prevailing traffic speed, and depends on whether or not there is a crossing island. Signalized crossings are assumed to pose no traffic stress to cyclists. [One potential future refinement could be to establish criteria for when a signalized crossing deserves LTS 2 because very long signalized crossings can be difficult for children.] HAWK signals (“hybrid pedestrian beacon”) certainly qualify, since they display a red signal to car traffic. Draft criteria for level of traffic stress at roundabouts have been established. Feedback is welcome. By default, all treatments are assumed to apply equally for 2-way bike travel. That means some care must be exercised in treating one-way streets and streets with different treatments in different directions. 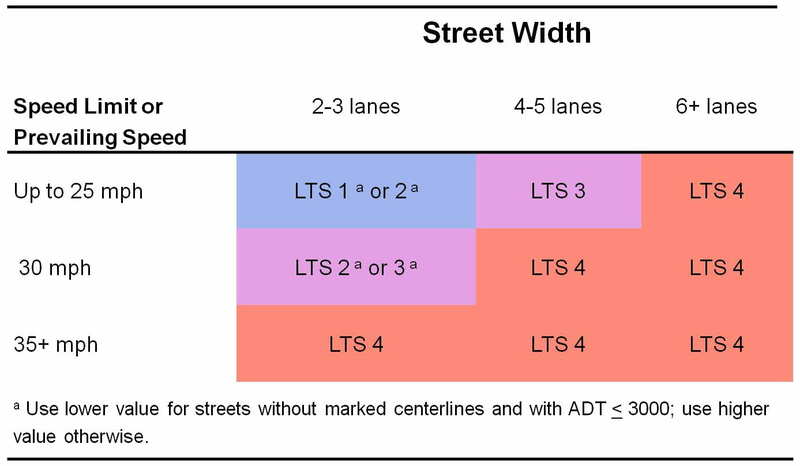 The usual set of criteria can be applied to determine LTS in the allowed direction of travel, with one modification: number of lanes should be doubled, and the street treated as though it has a median. For example, the stress to a cyclist on a one-way street with 2 through lanes is the same as the stress would be on a 2-way street with 4 lanes that’s divided by a median into 2+2 lanes. The calculated LTS for going in the allowed direction of travel can be applied directly on local streets. On higher level streets, however (collectors, arterials), the calculated LTS can be applied direction only if there is a very-nearby, opposite direction path (typically an opposite direction one-way street) offering the same or better LTS. [Why: Because route and network evaluation software assumes bi-directional travel, and so giving a low LTS to a particular street will be interpreted as providing a low-stress route in both directions.] For example, suppose E Street and W Street form an isolated one-way pair going east-west. 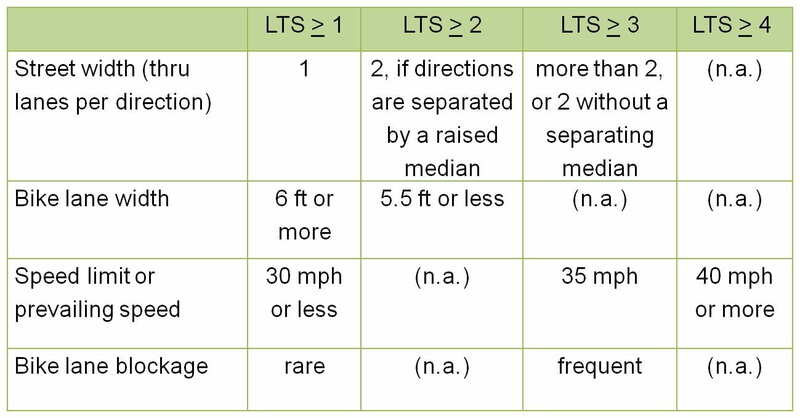 If the calculated LTS on both E Street and W Street is 2, then they can both be assigned LTS 2. But if the calculated LTS on E street is 2 while the calculated LTS on W Street is 3, then both streets should be assigned LTS 3. Weakest link logic should apply to streets with asymmetric treatments – the direction with the higher level of stress applies. For example, if a street has a bike lane in one direction but not in the other, the direction in which bikes are in mixed traffic will determine the street’s LTS. One-way streets with bicycle contraflow fall into this category.